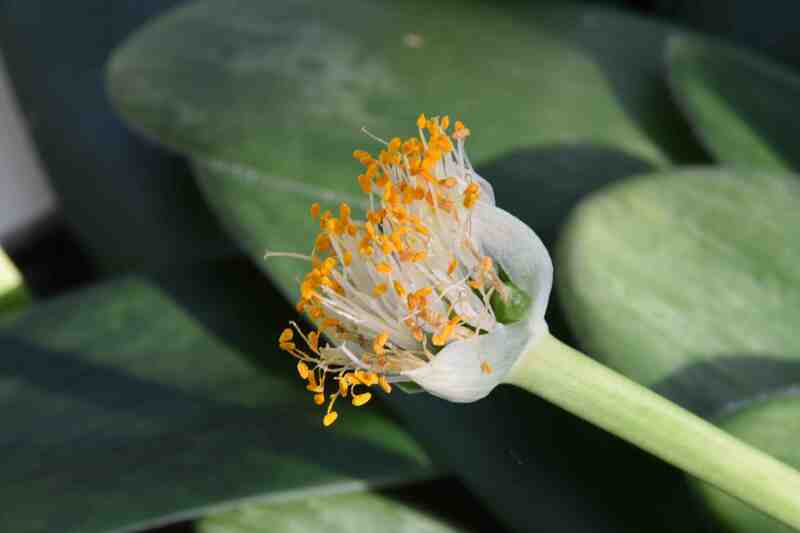 It was nice, the other day, to renew my acquaintance with Haemanthus albiflos. I first saw this plant when I was a student at Kew and in the hostel there was a large potful in the toilet – well not actually in the bowl (it is not a bog plant) – but on the windowsill. It is the perfect plant for a toilet because it withstands neglect and won’t punish you if you don’t pay it a lot of attention. I then saw it again when I worked on the site of HollyGate cacti in Sussex and for many years had a plant. I am not sure when I lost contact with it but I must have given it away during one of my many moves. This easy-going and long-suffering plant is rather curious and can be attractive. It is a South African plant that grows in dry, rocky places in the wild. 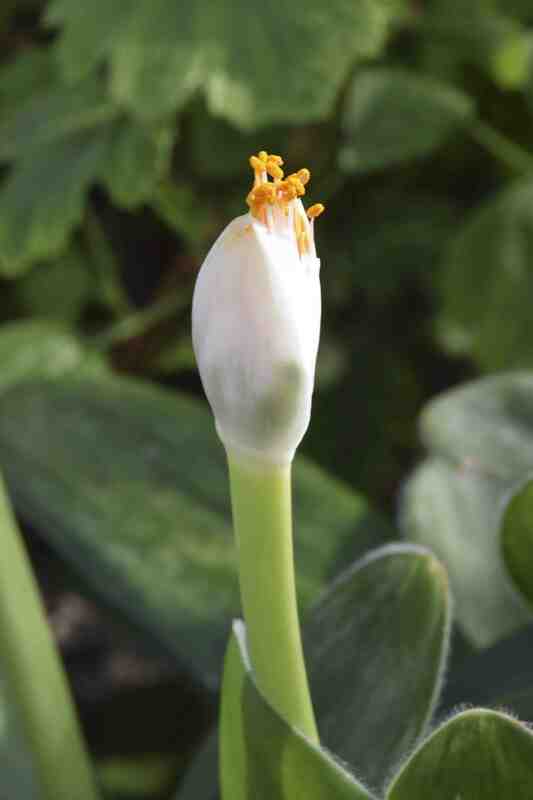 There are about 20 species of haemanthus and they usually have red flowers (haemanthus means blood flower) and most are deciduous bulbs that grow in full sun. Three of the species are evergreen and this species is one of these and is unusual because it prefers some shade. So here we have a drought-tolerant plant that has a bulbous base that can tolerate shade. The leaves are thick and tongue-shaped and with hairs around the edge and on the reverse of the leaf and shiny on the upper side. They will get scorched and yellow in bright sun and rather longer than usual if the spot is too shady. Over time the plants form clumps but it is best to leave them to grow into a large potful. The roots are not deep and a shallow ‘half pot’ is best and a soil-based compost with added grit of the kind you would use for cacti. When happy and settled the plants produce their distinctive flower heads. Most haemanthus have showy clusters of bright flowers surrounded with large red bracts. But in this species the flowers, composed largely of white, gold-tipped stamens open as a tuft, with small, white bracts and they resemble a shaving brush. The flowers are usually produced in winter but they can occur whenever the plants feel like blooming. This plant at Glasnevin had two flower spikes in October. If you are lucky the flowers are followed by showy red berries. The plant is not frost-hardy but will take low temperatures if it is kept dry. Growing slowly, being easy to grow and surprising you with attractive flowers every now and then it is the perfect houseplant. I see something new here all the time… Thanks. what bike do you ride bro?